Clean washed condition. No tears, no holes, no stains. Inseam 30”. Waist 28”. • AG Adriano Goldschmied Prima mid-rise cigarette pants. AG Velvet Pants. • Black 5-pocket velvet pants. • Rise 8.5" & Inseam 30". • 80% cotton; 15% modal. • Waist 26". Adriano Goldschmied. The Farrah Skinny. Black Velvet. Waist 16" across, rise 11.5", inseam 30", hip 19" across, leg opening 5" across. 54% Cotton 35% Modal 8% Polyester 3% Polyurethane. AG Adriano Goldschmiedt The Farrah Skinny, High Rise Skinny, black wax coated jeans in great pre-owned condition. Size 26 R.
Adriano Goldschmied The Ballad Jeans size 27. Soft cotton velvety corduroy. 14" flat lay waist. 30" inseam. This item is in pre-owned condition and shows moderate wear from previous use, including missing size & contents tag, wrinkles and some slight color fading. Waist: 30"
From Anthropologie, Adriano Goldschmied Stevie ankle sateen black jeans pants, size 26. Great condition. Silky, sateen brushed finish, slim straight leg jean, 5 pockets, stitched embroidery at back pockets, tonal top stitching. Style the janis hogh rise flare. Color black. What I consider to be GREAT pre owned shape may differ from your opinion. Color may vary slightly. I do not feel comfortable in that situation. This is for your protection as well as mine. Coated, waxed look, legging quality jeans in a size 28 regular. Flattering fit. Relaxed skinny leg. - 4 pocket construction 2 cargo pockets with snap closures. Fiber Content. Machine wash cold. Sizing: fits approx 30=8/10. 80% cotton, 15% modal, 5% polyurethane. Waist across: 17”. ADRIANO GOLDSCHMIED. WAIST: 27". INSEAM: 29.5". VERY NICE SKINNY CROPPED BLACK JEANS SZ 29 THE RISE 10/14 THE WAIST 15.5". VERY GENTLY PRE-OWNED AG THE EX-BOYFRIEND SLIM JEANS SIZE 28 WITH A 27.5" INSEAM. Condition : There are no visible signs of wear at all! That's why! Straight Leg Opening. Color: 1 Year Super Black. Type Jeans. Discover daily new arrivals in all seasons, sizes and styles that you can't find anywhere else. Material Cotton. Color Black. All details of the product have been included. Item Details. There is no size tag. Please review measurements carefully to ensure a proper fit. Measurements (laid flat and not stretched): Waist laid flat: 13.5” Inseam: 34” Length: 41.5” Rise: 8” *All measurements taken with a measuring tape and are best estimates. May be slightly off. Soft and slim. Good pre-owned condition. AG Adriano Goldschmied "The Jodi Crop" high rise slim flare velvet jeans in Super Black. 54% cotton, 35% Modal, 8% polyester, 3% PU. Inseam: 26". Leg Opening: 8". Waist: 13.5". Adriano Goldschmied - Alexa Chung For AG. Straight Leg Black Denim Jeans. 100% cotton. Leg opening: 18". Made in USA. AG Adriano Goldschmied Jeans Womens Stilt Cigarette Leg Black Stretch, Tag Size 26R, Measured Approximately 28x30 These jeans are in very good, pre-owned condition. Minimal wear showing from gentle use and wash. No obvious holes, tears or stains noticed. Please see all pictures closely for better details and actual measurements. Pictures are also part of the description. Please DO NOT go by your pants tag size only as all pants can wear and stretch differently. Measure a pair of pants that fit you and compare them with the shown true measurements, to ensure proper fitment. Shipped with USPS Priority Mail delivery. Style: Skinny Straight. By AG Jeans; made in the USA. Faded and worn-in looking jeans exude an understated cool. Photographs serve to illustrate condition of item. Colors can vary slightly due to computer monitor settings. AG Stilt Corduroy Cigarette Leg Jeans. Soft corduroy with stretch. - knee - 14". - leg opening - 12". 98% Cotton 2% Polyurethane. - back rise - 13". Ankle length. I can provide sales receipts for all and any of them. Find comfort in a new pair of The Angel jeans from AG. THE ANGEL – BOOTCUT JEANS in size 28. Features a slim fit through the knee and breaks into a subtle flare at the hem. Crafted from stone washed black STRETCH"denim and finished with gold stitching and brass hardware. $8 SHIPPING!!! Beautiful black denim, Stilt Cigarette Leg style, zip fly, 5 pocket styling. Excellent condition, as I only wore these once. Washed and hung to dry. Measures 15" across waist, 8.5" rise, 30" inseam, and 6" across ankle hem. Please ask questions prior to bidding. Thanks for looking!! Pre-owned Adriano Goldstien Skinny Jeans. Style BW9991. Fantastic pair of AG jeans! Luscious Super Stretch Sateen, With Our Leatherette Coating - 59% Cotton, 31% Modal, 8% Polyester, 2% Elastane. This super skinny fit creates a shape enhancing silhouette. Lightweight superstretch sateen lends a refined feel and rich color to this style. AG SZ 26 Jodi crop black Jeans. Hi-rise slim flare crop. Great condition, awesome wash. Smoke/pet free home. 10.25" Rise. 26" Inseam. 17" Leg Opening. AG ADRIANA GOLDSCHMIED Jeans. very good condition-. Waist: 34". 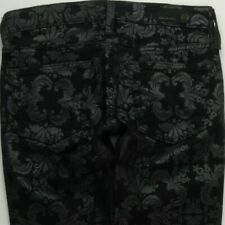 AG Adriano Goldschmied The Legging Super Skinny Black Size 28R EUC Beautiful! XSSML2468101423 in.24 in.25 in.26 in.27 in.28 in.29 in.30 in.31 in.32 in.